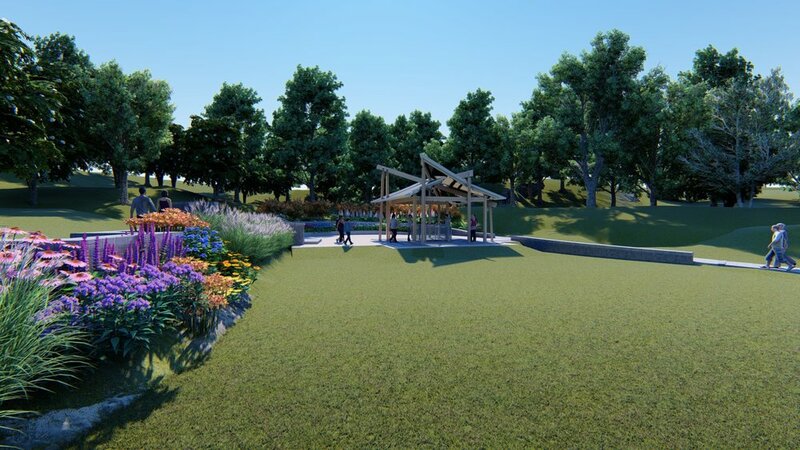 The Heritage Sandy Springs Enhancement Project is an invited design competition that envisions the re-development and re-vitilization of the four acre city namesake park. The park is used for many purposes - special events, company picnics, weddings, educational tours as well as casual visitors. The new Sandy Springs of today is in need of its own meeting place - a welcoming park which celebrates the cultures that previously inhabited it, the restoration of its natural, ecologically sound environment and a quiet retreat for nearby residents, office workers, and educational groups. Over the years, the 19th century Williams Payne Residence has been added to the site as well as miscellaneous garden structures and the nearby performance amphitheater. There is no more important work for an architect than helping to re-establish the cultural legacy of a city. Enduring architecture has a story to tell - that story is the outward expression of an inner world of ideas, both timely and eternal. The Heritage Sandy Springs park re-development is such a vision. The new walkway is to be constructed using native granite inlays describing points of interest bordered by a continuous native granite wall. The walk describes a journey through past cultures and indigenous flora and fauna that have inhabited the site: Cherokee, early 19th century European settlers and 20th century farmers. The wayside viewpoints describe a variety of native plants seen on the slope below, including Swamp Sunflower (Helianthus angustifolius), a significant plant to the Cherokee Indians, representing both humility and power. It was thought of as the spirit of the sun found in every planting field. Our native Phlox was one of the first North American wildflowers taken home by Europeans to plant in their own gardens. Its flowers were so highly valued that in Victorian England, bouquets of Phlox were given as a sign of love. The new pavilion is set on a raised podium which serves as a stage for wedding services and is shaped in such a way that the planes floating overhead reflect the sounds, light and figures that still inhabit the original “spring in the woods”. The overall form is a metaphor of the trees embracing it, constructed of FSC cypress with steel connections, a reflective mylar ceiling, and stainless steel shingle roof covering. The spring itself will be activated by re-circulating continuous sheets of water down the four sides, with sound, light and visitors reflecting off the ceiling above. It is primarily approached from the east and west, the south aspect is for wedding performances, and the north terrace accommodates casual office worker lunch breaks. A second phase of the work will expand the continuous pedestrian loop into a floating eco walk system which engages the stream restoration environment: naturally cleaning water, and wildlife return. Local artists' installations will be interspersed along the walk and a contemporary expression of the old 19th century camp meeting cabin is to be constructed at the intersection of old and new. Wayside viewpoints describe a variety of native plants seen on the slope below. The new site design calls for redevelopment of walkways, graphics and lighting. The sweeping pedestrian walk allows for close inspection of indigenous plants along its border and distant views of the new pavilion. The pavilion structure is a celebration of the genesis of the original spring: the sound, light, texture, and human interactions of nature.